UCL has submitted a planning application to transform Wates House for The Bartlett School of Architecture. At a total project cost of £30 million, the design by Hawkins\Brown will double the amount of teaching and research space available in Wates House to the school's students and staff, while retaining the building's existing structure. The entire building has been reconfigured to include significantly more studios and breakout space, encouraging collaboration across the school. Central to the design philosophy is opening up the façade of the building to reveal the activity within. This has been achieved by placing formal and informal exhibition spaces at ground floor level, inserting a new staircase to open up the building'scirculation, re-orientating the entrance and expressing key spaces to give strategic views of London. Andrew Grainger, director of UCL Estates, said: "Wates House is a critical project, part of the estate transformation works set to start this summer to improve UCL's buildings and make better use of the space that we have. The building will be stripped back to its shell and completely remodelled, adding space including a new full height extension facing Gordon Street, and a lateral extension to the building perimeter. "With its impressive façade, the new Wates House will act as a gateway to Bloomsbury's university quarter. The development is a great illustration of the innovative solutions that we are now adopting across the campus to better serve students and staff with much improved facilities and a more robust and dynamic use of space." We decided to retrofit Wates House rather than to demolish and rebuild. Retaining the existing structure not only saves embodied energy, but adds a certain quirkiness to the design. Care has been taken to ensure the design of the building fits in with the surrounding area, which sits within the Bloomsbury Conservation Area and on the southern edge of the Euston Area Plan. Euan Macdonald, partner at Hawkins\Brown, said: "Designing the home of The Bartlett School of Architecture has been a challenging, but richly rewarding experience. Our design has evolved through intensive dialogue with the building users and the planning, conservation and design officers at Camden. Key drivers are the creation of a building that reflects the quality of the school's teaching and research, whilst also making a positive contribution to the surrounding conservation area." The project is part of UCL's wider programme to modernise its Bloomsbury Campus and is seen as an important opportunity to demonstrate how the retrofit of the 1970's building stock is possible, producing world-class architecture whilst retaining the embodied energy. Professor Alan Penn, dean of The Bartlett, UCL's Faculty of the Built Environment, said: "A real challenge facing society is how best to improve the quality of buildings constructed just a few decades ago. We decided to retrofit Wates House rather than to demolish and rebuild. Retaining the existing structure not only saves embodied energy, but adds a certain quirkiness to the design." 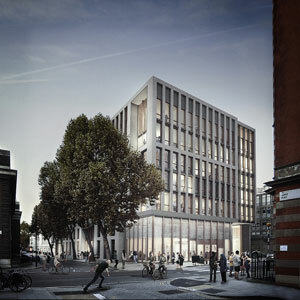 For the two academic years starting September 2014 The Bartlett School of Architecture will relocate to a temporary home on Hampstead Road, also designed by Hawkins\Brown. Subject to planning approval from the London Borough of Camden, the project is expected to start on site before the end of the year. Professor Bob Sheil, director of The Bartlett School of Architecture, said: "Wates House has hosted many spectacular events, visitors and projects over the years, however it no longer meets our day to day needs. The prospect of having more space and better facilities is very exciting. We can't wait for it to be ready, and for an new era of this highly distinguished School to flourish."